I'm new to Subsonic but find it pretty awesome and it's exactly what I've searched for. I read in the feature list that it's possible to edit tags in Subsonic. Where can I do this? Can someone point me to the spot? Last edited by TomHH on Tue Sep 13, 2016 7:39 pm, edited 1 time in total. Load an album in the web player, and underneath it's title you'll find links to actions...'Edit Tags' is just after 'Download All', under the big orange play button. Ether there's something or I'm totally blind - I got no 'edit' button. that's all I see wether I mark a song or not - makes difference. I'm on v6.0 and tried Chrome and Safari (OS X 10.11.6) using an admin account. Any ideas? Bug in the theme? Which one do you use? I also tried the default theme - same rendering. I'm getting a drop down box. It isn't in the 'player' part at the bottom. It is in the options in the main frame. I think it only shows up in 'album' / folder mode, not for playlists. Nope - no 'Edit tags' in album view! Am I stupid or is it really so hard to find? Check if your user have privileges for editing. Go to Settings -> Users. Select you user and check "User is allowed to change cover art and tags"
BTW: I also checked the access rights on the server - they're all fine! I don't see any errors in the logs nor do I get errors in the browser (DevTools console). I'm using Chrome / Safari on OS X 10.11.6 (cleared cache, cookies already). There is no "select and edit only these files". That's never been there. Just see the screenshot a few above: it is just a single link "edit tags" that is on the page itself, not the dropdown. It will bring up the editor for all the files there. You can't just subset which ones you want to edit. no 'Edit tags' - why? Can some of the folks who have this magic "Edit tags' link tell me on which OS their server is running and which browser they use? Is there a debug option for the server? 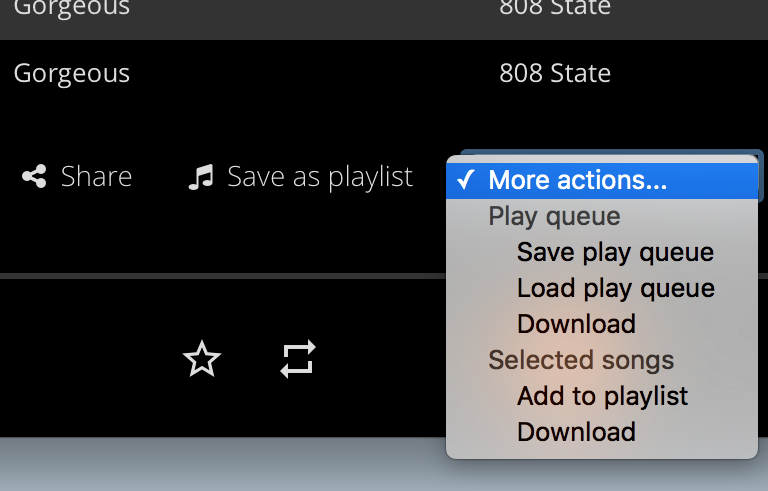 It is weird that you don't have any option above the playlist of an album, not even "Play all | Play random | Add all". I've never seen something like that. I don't know if there is a debug option. I've chosen the brute force solution - kick it and set it up from scratch! and then start and configure - done! Nevertheless I would have been very keen on knowing what the problem was. WTF - it's the 'Party Mode''! If you enable it the actions will be removed to simply the UI and to prevent batch processing! !